Receiving is a good thing though they say giving is more important. Receiving is not what we think it is as in birthday presents and people doing you a favor. Those are all part of it, but to me, receiving is a state. It is an exchange of energy between people and I don’t disregard that, but receiving is so much more. It’s a state of “grace”, of being fulfilled, of gratitude for life as a whole, not just the perks we get. When you’re in a state of receiving you are not chasing anything, no gains, no positions, no desires, no wants. You are open to receive whatever comes, but if you are filled with gratitude for life, mostly good things come to you. It’s not easy to gain that state of receiving in a consistent manner, but by examining life and all those beliefs and habits that hold us back, we can learn to accept it ALL, and from there gain appreciation about the mystery of life. We basically don’t know any more than newborn babies. They know more that we do in a greater sense. They are still pure and innocent, as we once were. They are in a state of receiving. As are pets if you think about it. They lie around all day and don’t worry where their next meal is coming from. It never enters their mind, and they are always provided for. In a sense they take for granted that life will support them. And it does. Meanwhile, humans run around, or rush down the closest highway to get to nowhere. We worry and curse and plan. We are always chasing money. The whole day is revolving around making money. We lost that innocent trust a long time ago, traded it for a man-made world that offers a lot of pain and suffering. When we claim life and stop struggling, something shifts. Life becomes more beautiful and filled with situations we can be grateful for. The more accepting and grateful, the more abundant the gifts from the universe. It’s not easy to change, but by becoming aware of what we do, and why, and what we say, and our prejudices, we can slowly shift the energy to be more supporting and loving of ourselves. The more you love yourself, the more the universe will support you! What does this have to do with art, you ask? Really everything. We tend to criticize and judge our art efforts harshly. We have an idea of what the art should look like, and it never does, so back condemning the effort. It can be a vicious cycle. Many stop making art because of it. What if the art you make turns out ugly (in your opinion.) What then? Do you continue or just drop the whole adventure? If we don’t stick with it, we miss out of the mystery. The adventure becomes a hurried rush down the highway, like with so many things we do. We are addicted to doing and seeing results. When you can shift and be in a receiving mode as you begin your art session, you are in a non-judgmental state and can receive the art as it manifests through you. That is such a gift! It might not look like much, but your energy is in it. The receiving as a state of grace shows up in your art. Even if you only painted a blue line across the canvas, people will feel something. We might admire technique but it’s the energy that draws us. Stop chasing, become a receiver of life. Make open stillness be part of your daily process. 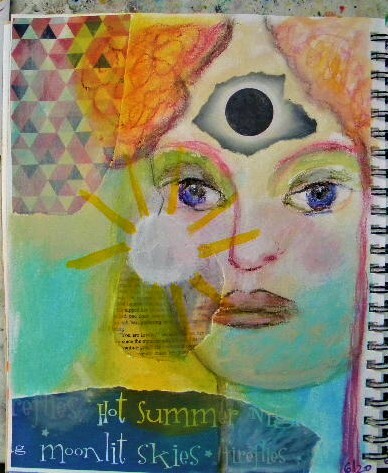 I did some art journaling lately. I can’t say I reached that magical state of wonder, but I had fun. I guess I was into yellow and blue this week. To be open to receive is to allow, to accept, and live in gratitude for what is, and what appears on the page. I have some ideas if you’re looking for a gift. My etsy shop has lots of cool gifts. Earth and Faery. You can read some of my older blog posts for more inspiration: Why do you do what you do? Have a great and safe July 4!